PGS Commercial Grill Bulk Discount Available. Are you a Pro? Bulk discounts available on PGS T-Series Commercial Gas Grills. Let us help complete your project under budget! Call our consultants at 877-743-2269 to get a quote today! Weber Grate Grill Cleaner - 16 Oz. Designed to withstand the rigors of daily use in commercial settings such as apartments, condos and resorts, the PGS T-series is engineered with strong, durable materials while featuring a simple design that is easy to use. This PGS T40 cast aluminum grill features durable and permanent cast aluminum housing and a 40,000 BTU stainless steel dual-control H-shaped burner. The Sure Start electronic ignition ensures that lighting your grill is a quick, safe, and easy process. The 5/16 inch stainless steel rod cooking grids, ceramic Moon Roks, and porcelain coated steel Moon Rok tray deliver even heat distribution across 434 square inches of main cooking area. The control panel features laser-etched instructions, anti-theft control knobs and a built-in one hour FuelStop gas flow timer. This T40 gas grill also includes two stainless steel side shelves, black powder coated aluminum pedestal, and black flat patio base. Cooking Grid Dimensions 25 1/2 X 17"
AEI includes a one (1) year parts replacement warranty on all T-series gas grills. PGS has a great reputation for producing well-constructed grills with quality performance. 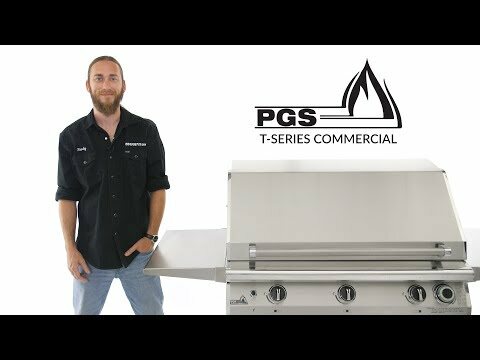 Designed to withstand the rigors of daily use in commercial settings such as apartments, condos, and resorts, the PGS T-Series commercial gas grill is available in all 304 stainless steel or rugged cast aluminum, and engineered with strong, durable materials, while featuring a simple design that is easy to use. While PGS doesn't have a lot of flashy bells and whistles, they focus on quality and durability for commercial applications. I love the integrated 60 minute gas flow timer, right there on the control panel next to the main burner control knobs. As a matter of fact, PGS is the only manufacturer with the gas flow timer integrated as part of the burner controls on the grill. Because the gas flow timer is a permanent part of the grill, the ETL certification includes the integrated timer. While other gas grills may offer gas timers as an accessory, their grill’s certification does not cover the timer. This certification is important to builders and property managers as it reduces the liability associated with combining parts, such as a gas grill with a separate gas timer. Two other great commercial features that PGS thought of that make a ton of sense are their anti-theft knobs and laser etched Lexan instructions. A fairly common problem for multi-user communities that have gas grills is when a resident removes a knob off the grill in the morning, ensuring the grill will be available to that resident alone, when he/she gets home from work! These PGS knobs cannot be removed, which is a big win for property managers, and the other residents that live with the knob thief as well. As for the laser etched instructions, these are sure to stay visible on the control panel as long as you own the grill, no matter how many cleanings they go through or what sort of weather the grill is exposed to. This ensures the resident will always have correct, readable lighting instructions, and when “safety first” is always a concern, this is a legitimate plus. Other brands’ instructions are usually screen printed or on sticker labels, which will be wiped/weathered away eventually. As for the cooking system, I really like the thick, 304 stainless steel "Vari Grid" cooking grids, that feature a variable rod spacing arrangement, which offers flexibility for whatever your cooking and helps ensure your thinner foods won’t fall through the gaps. Under the grids are flat ceramic moon rocks which sit on thick stainless racks above the burner. These help with the heat distribution but mostly provide a full width surface for flavorization of the food drippings. I love the burners, which are high heat output, u-shaped stainless steel burners with good heat control so you can dial in precise temperatures from low to high. Another nice feature I really like is the thermometer, which is situated to the right side of the grill lid, just above the cooking surface for more accurate grill temperature reading. 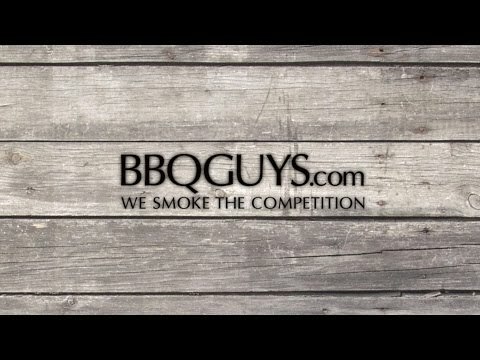 You can take comfort in knowing that PGS is a brand that has been around for many decades and has a reputation for having amazing customer service. PGS grills are made in the USA and are covered by a 1 year full parts replacement warranty when used in a commercial application. The continuous spark ignition is battery operated so you’ll need to make sure you always have fresh batteries to ensure you users can light the grill. That said, if the battery goes dead, your users can still light the grill with a match or lighter using the handy flash tubes, which is explained on the laser etched instructions. You want a durable grill, that is made in the USA, and loaded with smart features that are perfect for any commercial/multi-user application. 25 1/2 X 17" 25 1/2 X 17" 25 1/2 X 17" 24 X 18"